When many of us think of a mechanical broom street sweeper, we likely envision the street sweepers that sweep through your town or city upon the arrival of spring. But there are actually several other uses for this rugged piece of machinery. Major uses of the mechanical broom street sweeper include keeping the parking lots of shopping centers, large office parks, and industry warehouses neat and tidy, providing a presentable appearance to patrons and customers. As any business owner or commercial property owner knows, appearances are everything, especially first appearances. The appearance of your company’s parking lot could make or break the image of your business or your brand. Municipal: In some areas of the country, the public works department chooses to hire contractors to handle the street sweeping. Road Construction: During road construction, it’s required by the DOT to make sure that the road’s surface has been cleaned and cleared entirely before the laying of fresh asphalt. Street sweepers on any type of construction or paving and asphalt milling operation are used to pick up big and small pieces of asphalt, control dust, gravel, mud, and of course, dirt. Street Sweeping: This type of sweeping is common and is used to pick up debris such as dirt, litter, grass, sand, and sticks from the streets of cities and towns. These tasks are considered to be “lightweight” tasks. Leaf Removal: As you can likely guess, this type of task occurs in the fall when gutters become blocked by leaves, which can affect drainage. Catch Basin Cleaning: Some towns and cities use street sweepers to routinely clean out their catch basins to prevent flooding issues. Year Round Sweeping: Some municipalities in the northern region utilize street sweepers to keep streets free of salt residue, gravel, sand, and other material commonly found on roadways during the winter months. 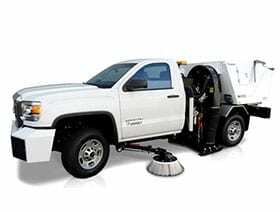 Spring Clean-Up, Heavy Duty: This is the use that you’re probably most familiar with when it comes to street sweepers as stated above. Cleaning up the streets of your city or town, clearing the roadways from winter materials and debris. For questions regarding the mechanical broom street sweeper or to request an estimate, contact the professionals of Atlantic Sweeping & Cleaning, Inc. today! The regenerative air sweeper is a green sweeper that combines sustainability with efficiency. This green sweeper keeps the environment free of pollutants thanks to its air-blast capabilities. The sweeper’s large patented gutter brooms, its heavy duty suction hose and its large hopper make it one powerful, versatile sweeper that can remove debris, dirt, and even trash in an instant. Its fuel efficiency and large water tank enables you to get more cleaning done without frequent stops in order to refuel, dump or re-water the truck. When you keep your parking lots and streets clean with the regenerative air sweeper, you’ll keep your property or municipality looking its best at all times. Parking Lots: Have you ever walked through a parking lot, especially after a large event and noticed trash all over the place and then wondered how they’re going to get it all cleaned up? Can you imagine how time consuming it would be if this trash were picked up by hand? Thanks to the regenerative street sweeper, parking lot messes are a breeze to clean following any big event. In addition to trash, these sweepers are frequently used to keep parking lots free of any fine dirt, rocks, gravel, and leaves from parking lots. Spring Cleaning: ollowing the departure of winter, its wrath is evident in the condition of the roadways during spring clean-up. The regenerative air sweeper is the ideal solution to removing the mess left behind from snow plows such as salt, dirt, and any leaves still remaining on roadways or in parking lots come spring. These sweepers are great for getting into asphalt or concrete crevices. It vacuums these areas clean with its powerful air flow and wide sweeping path. Road Clean Up: Not only are regenerative air sweepers great for big spring cleaning jobs on the nation’s roadways but they’re also great for road clean-up following a big or small construction project. If you’ve got a big project coming up like the expansion of roadways, repaving roadways or a parking lot, the addition of new sidewalks, etc. you’ll need a street sweeper before and after the job. Before getting started, it’s important and often regulated to clean any roadway prior to getting the job done and following the completion of the job. This ensures a job well-done and a town or city that looks amazingly clean. 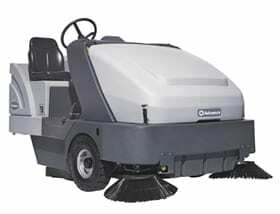 This industrial sweeper is a powerful solution to cleaning anything from warehouse floors to parking garages. Featuring a unique design, the Proterra floor sweeper is truly one-of-a-kind and it makes cleaning large facility areas easy thanks to its maneuverability, mighty hopper, and its ability to clean wide paths. When you use the Proterra to get the job done, you’ll enjoy safe cleaning, comfortable cleaning, and efficient cleaning. One of the most exciting features of this sweeper is its DustGuard system, which works to effortlessly suppress dust while we work. Your facility will look its best when you keep it clean on a routine basis. Warehouses: When running a warehouse, it’s important to keep your floors free to avoid any hazardous conditions that could lead to an accident of any kind.Floors may be prone to dirt build-up and debris build-up, which is a cinch to clean with this powerful industrial sweeper. Factories: Keeping the floors clean of a factory is just as important as keeping the floors clean within a warehouse environment. 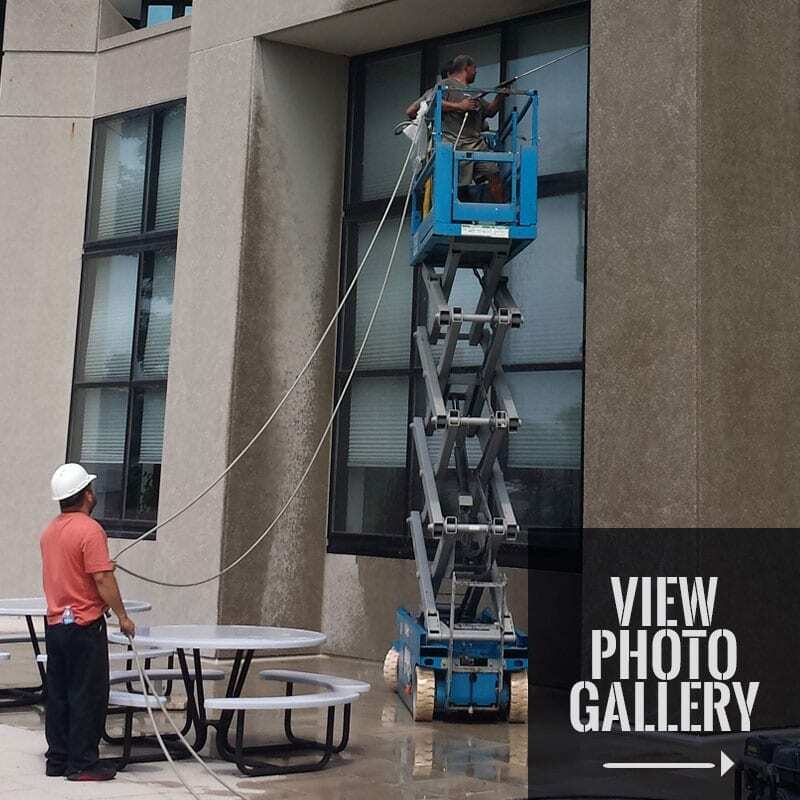 This helps to avoid employee slip and fall accidents or other hazardous types of problems. Factories must also maintain a neat and clean appearance to meet certain regulation demands as well. When we keep your factory floors clean with a Proterra, your floors will look their best and you’ll never have to worry. Parking Garages: If you own a parking garage, it’s important to keep these areas clean for appearance value and for safety reasons. It’s also important to ensure the integrity of the parking lot itself. These areas should be maintained and cleaned throughout the year, depending upon your need we offer, daily, weekly, monthly, semi-annual and annual contracts. The Osprey Conventional sweeper truck is a powerful hydraulic sweeper with the ability to sweep clean any retail parking lot or parking structure. This heavy-duty sweeper can handle both big jobs and little jobs. Featuring a revolutionary design with a low clearance conventional chassis and a VFC hydraulic system, you’re guaranteed a sweeper that is both efficient and really gets the job done. This sweeper is the ideal solution for any residential or commercial property owner and it’s frequently used for condos, home owner associations (HOA’s), and small parking lots. These trucks can be used for spring cleaning or any-time cleaning. 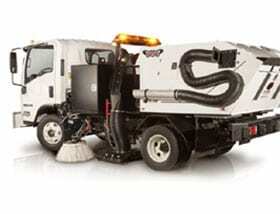 Small Parking Lot Clean-Up:Small business owners may wish to utilize the powerful Osprey Conventional sweeper truck to keep their parking lots looking clean at all times. As a business owner, you know that the appearance of your property, including the parking lot, can make or break your business. By using this sweeper truck, you’ll keep your parking lots free of debris, dirt, rocks, trash, and leaves. Other examples of small parking lot clean-up include apartment complex parking lots and small office parking lots. 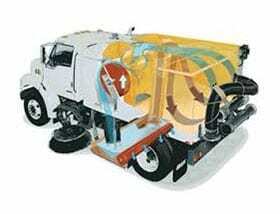 Condo Lots:Sweeper trucks are used for condo lot cleaning annually. Any time is a good time to clean your condo’s lots. If your condo lot looks like it’s ready for a cleaning, get the job done with the efficient Osprey Conventional Sweeper Truck. Any of these small parking lot examples should be cleaned prior to the arrival of winter, following the departure of winter and throughout the year to ensure that parking lots are clean at all times. You should also have your small parking lots cleaned prior to any paving, etc. The Nitehawk Raptor is a single engine sweeper featuring a cab over chassis design, with a fuel efficient and powerful VFC hydraulic power system. These special design features make this one heavy-duty, high-power, efficient sweeper that is guaranteed to enhance cleaning performance and increase productivity. The Raptor is perfect for getting large parking lot jobs done when there are noise ordinances due to its quiet single engine design. Mall Parking Lots:Mall parking lots are prone to messy conditions, especially following a large event, a busy Friday or Saturday, and the winter months of the year. When cleaning a mall parking lot with this single engine sweeper, you’ll keep a neat and tidy appearance at all times while ensuring the integrity of the parking lot. Large Shopping Center Lots:The Nitehawk Raptor Single Engine Sweeper is the ideal solution to keeping the parking lots of large shopping centers free of dirt, debris, trash, rocks, and leaves. Large Office Lots:Office space with large parking lots frequently utilize this powerful sweeper to keep the property looking its best for patrons, customers, and/or clients. Large Apartment or Condo Lots:TSometimes the parking lots of apartments or condos can be so large that it requires a more suitable sweeper and that’s where the Nitehawk Raptor Single Engine Sweeper comes into play. The Raptor is perfect for keeping the parking lots clean for apartments and condos.